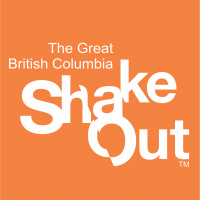 Now available in Canada – Exclusive to Total Prepare! A.M.A.Z.I.N.G. That’s what we have to say about these new EXOBAG Flameless Meal Heaters from ENDEXO. A state of the art meal heater, that reaches 220° Fahrenheit in 12 SECONDS! EXOBAG flameless meal heaters run for 12 minutes and can boil water! Try that with ANY other Meal Heater on the market. Heat a can of chili or beans, a pre-cooked meal or most anything else you can imagine. Can your Meal Heater hard boil an egg or cook fish fillets on its own? Ours can. TRY to find a superior product! 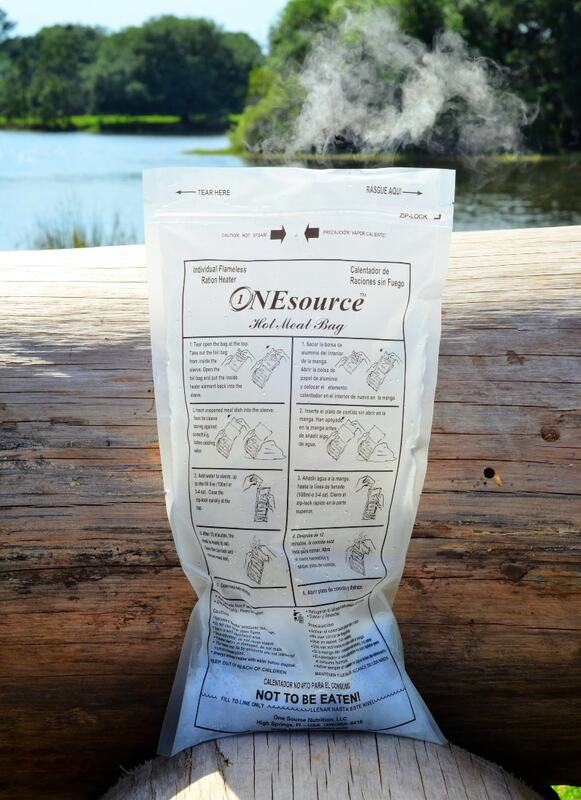 Get your supply today for your outdoor adventures or emergency kits! Click drop down menu below for quantity choices. EXOBAG Flameless Meal Heater by ENDEXO? The EXOBAG Flameless Meal Heater is the best flameless meal heater bag out there, and safe to use indoors! MRE Heaters & Flameless Meal Heaters (also referred to as FRH, FRH Heaters, Flameless Ration Heaters) are not all made the same. Traditional MRE Heaters only reach a factual 62.8°C (145°F) temperature on average after several minutes, not their claimed 82.2°C (180°F). 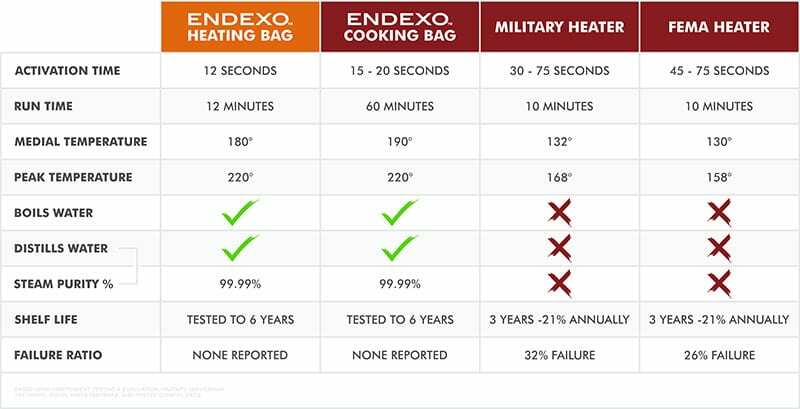 ENDEXO manufacturers a state of the art meal heater that reaches 104.4°C (220°F) in 12 SECONDS! These flameless meal heaters run for 12 minutes and boil water! 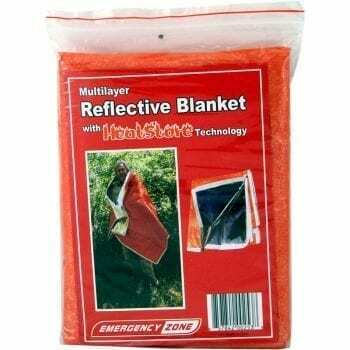 Try that with ANY other MRE Heater on the market. Can your MRE Heater hard boil an egg or cook fish fillets? These can. 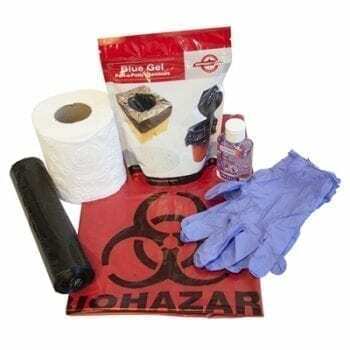 EXOBAG Flameless Meal Heaters are military grade and exceed the performance of any other meal heater you can buy. A standard meal heater is about 5 1/2″ wide x 14 1/2″ tall. These meal ration heaters are 7 1/2″ wide x 16 1/2 tall. That is a full 2 inches of extra space in both directions. This enables you to place glass or other heat resistant containers in the bag for heating. Tear open the bag at the top. Take out the foil bag from inside the sleeve. Open the foil bag and put the inside heater element back into the sleeve. Insert unopened meal dish into the sleeve. Have the sleeve leaning against something before adding water. Add water to the sleeve up to the fill line (100ml or 3-4oz). Close the zip-lock quickly at the top. After 12 minutes, the meal is ready to eat. Open the zip-lock and remove the meal dish. Open the meal dish and enjoy! Boils Water: Yes – in 12 Seconds!